Just some innocent browsing, y’know. 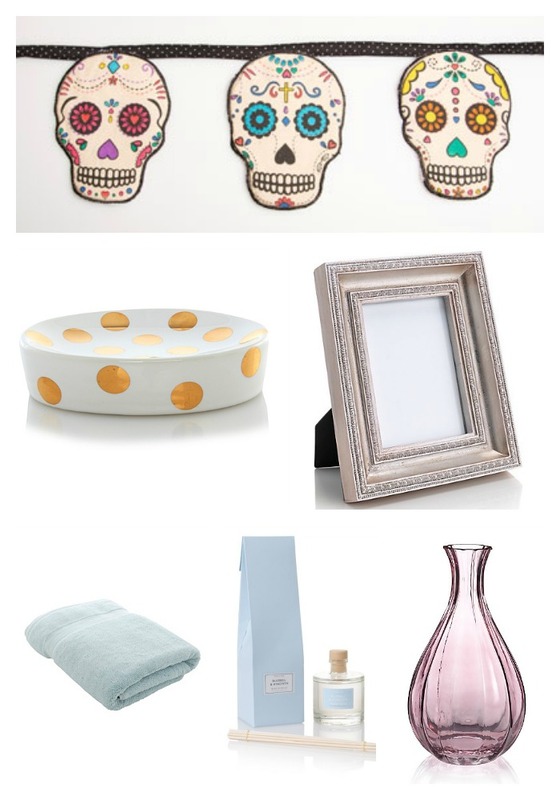 Finding little trinkets for the flat is definitely a good way to spend an hour or two… homeware is just one of my favourite things to look at. Maybe that means I’m a legit grown up? Or I like playing house. Who knows. Skull bunting because skulls! I love skulls – I think they look nice! – and this sugar skull bunting is all kinds of pretty. I can see it now, draping over the top of the curtains and making things look so much more exciting. This soap dish simply as cute as a soap dish can be. This photo frame looks so lovely, and will almost definitely make any photo I put in it look amazing. I actually have a teeny tiny Moomin print that I think would look amazing in this. Towels because… towels. These look so nice and fresh, and you always need towels, right? Bluebell & Hyacinth reed diffuser – I smelt this in Oliver Bonas over the weekend and fell in love. So springy! I love reed diffusers as well, because then it’s like room is constantly in a little bubble. Lastly, another vase for all the flowers I must buy! Where are your favourite places to browse for home stuff?